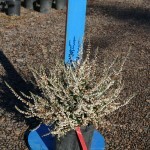 A ground cover shrub that forms a fine textured, dense mat. The double white blooms appear in July thru September. The foliage is bronze in winter, green otherwise. 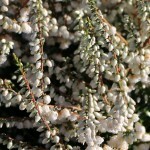 Calluna will grow best in full sun in an acidic, well-drained soil. Shear lightly after flowering to maintain a tidy form.